The Star Wars collector community knows no bounds. People collect everything from action figures to autographs, art prints to coins, but my favorite of all the collecting genre is patches. If you weren’t a patch collector before reading this, I hope that by the time you’re through you might want to snag your first. After all, patch traders are nothing without people to trade with. So what is it about patches? Well, it’s not just one thing, it’s many. Whenever traveling, I look up the local 501st garrisons and try to arrange a meet up. I bring my local Golden Gate Garrison patch and I’m often met with a local patch from my hosts. There’s the joy of acquiring a new piece, sure, but there’s also a great feeling seeing somebody’s eyes light up. There’s a sense of accomplishment, knowing that you were there to snag that new patch. You can go back over your patch collection and recall various events, where you were, who you were with, what it was like. Some forms of collecting solely require that you spend money, and that’s fine, but when you actually earn your collectible, it has more sentimental value. 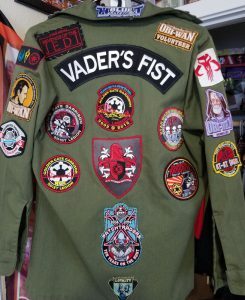 This goes beyond just Star Wars Patches. 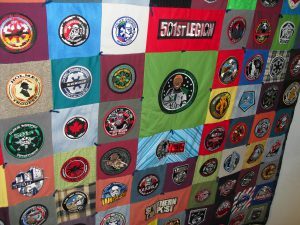 Motorcycle clubs, military folk, and punks all pride themselves on which patches they’ve earned and display them proudly. Many patches commemorate a particular event. It’s this kind of keepsake that sorts the haves from the have nots. You can tell all the stories you want about having been there, but the patch is proof at a glance. I’ve often burned with envy studying other people’s patches. Seeing that they have the patches I missed out on, and knowing that it’s highly unlikely I might ever own them. It makes you want to own the jacket that has everybody else rubbernecking. There’s definitely an air of pageantry to patch collecting. While you might have patches from a dozen different countries, there will always be more events, ergo there will be more patches. For a collector, this is a double edged sword. It’s ideal, in that you can collect in perpetuity, but it’s also the mountain you’ll never crest. A patch collector’s work is never done. For some collectors this probably sounds like torture, but me and my ilk wouldn’t have it any other way. Of all of the collectibles, patches are the most visible. You can literally wear them on your sleeve. One jacket might communicate that you’re a droid builder who has been to Celebration III, another might show that you’re from a volunteer for Rancho Obi-Wan. Regardless, any patch trader worth their salt will be able to discern your background without ever speaking a word (though it’s likely your patches will lead to a great conversation). Wearing patches is like a fingerprint, and a beacon to fellow collectors. No two jackets are the same, making yours a personal statement. There’s an entire community built around patch trading. You can get them online, or in person, you can consign your own designs, if you’re that committed. The treasure hunt aspect of patch collecting is also a thrill, scouring bins of vintage patches, hoping with bated breath to stumble upon some lost gem. Scoring a rarity is a triumph that any collector can understand. It’s as if the cosmos aligned just right, and it’s not so much that you were at the right place and time, but almost as if that patch was just waiting for you. These moments are glorious, and become rarer the longer you collect, so savor them. 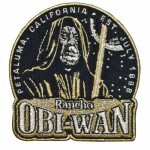 Rancho Obi-Wan, has literally thousands of patches and is constantly bolstering the collection, so much so that we’re actually not sure yet what the exact count is. We have patches from all over the world, from the 501st, Rebel Legion, Droid Builders, and Mando Mercs. Beyond the fan groups, we also have ILM crew patches, as well as Boy Scouts patches, C&D Visionary patches, and Topps Cards patches. 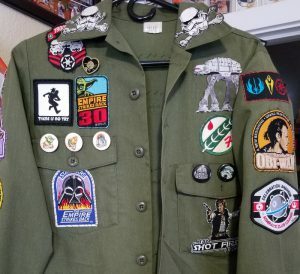 One particular stand-out patch is the Revenge of the Jedi patch, which was famously the original title for Return of the Jedi. Very few items were made with the original title, and I’m awestruck every time I see it — this is the power of the patch.